(Edmonton, AB.) A network of scientists at the University of Alberta is helping define and develop health innovations for people with unmet medical needs. 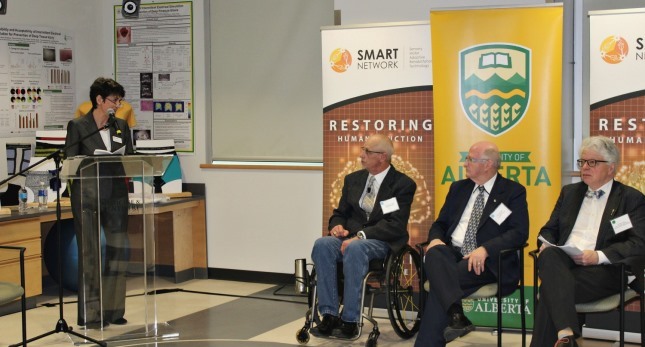 The Sensory Motor Adaptive Rehabilitation Technology (SMART) Network has been created at the U of A to develop smart medical devices and innovative rehabilitative interventions in an effort to improve quality of life and functionality for people with neural injuries and diseases. The network is enabling studies of the nervous system and new solutions for neurological problems and limb amputations. The SMART Network, led by Mushahwar, is comprised of more than 90 researchers in the fields of medicine, rehabilitation, computing science and engineering. It is based in a state-of-the-art centre for neural interfaces and rehabilitation neuroscience that was created with just under $8 million in funding from the Canada Foundation for Innovation, Alberta’s Ministry of Economic Development and Trade, and Alberta Innovates. The centre is headquartered in newly-renovated and equipped common space in the U of A’s Katz Group Centre for Pharmacy and Health Research. The foundation of the Network was created in 2010 as a core group of like-minded scientists began collaborating together. The team received approximately $5 million dollars from Alberta Innovates – Health Solutions (now Alberta Innovates) from 2010 to 2015 which it was able to leverage into $40 million in additional funding. The researchers decided to formally unite into the SMART Network as they realized both their collective successes and the areas still in need of improvement. The Sensorimotor Integration and Machine Learning Core develops intelligent sensorimotor computing paradigms for controlling neural interface devices and artificial limbs. The Rehabilitation Innovations Core will focus on generating crucial basic knowledge of the central nervous system and effective rehabilitation interventions and translating them to the clinical realm. The Virtual Reality Core will evaluate and provide guidance for revisions of neural interface systems and rehabilitation training approaches. It will also expand the delivery of health care to remote locations by e-health. The end goal of the Network is to transfer knowledge and innovations to clinical care to enhance standing, walking and reaching in people with limb amputations or neural injury or disease, and prevent secondary complications such as pressure ulcers and deep vein thrombosis. Other key partners include private industry, clinical centres, charitable organizations and importantly, volunteer participants living with neural damage who participate in studies.